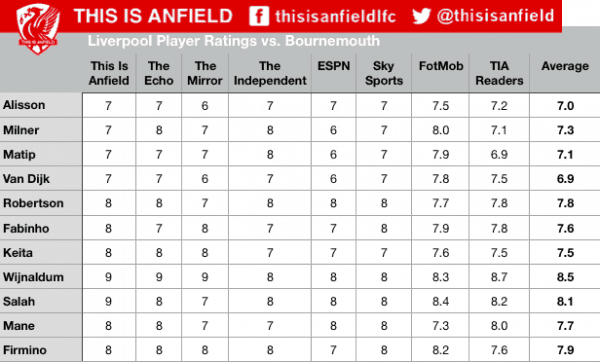 Liverpool eased to a 3-0 win over Bournemouth on Saturday and the media singled out a number of Reds players for praise. Jurgen Klopp‘s men were badly in need of a victory at Anfield and they delivered one in style, returning to top form and going top of the Premier League. Sadio Mane headed home the opener, Gini Wijnaldum‘s beautiful lofted effort doubled the lead and Mohamed Salah put the game to bed early in the second half. It was one of Liverpool’s most dominant performances of the season and it has eased the nerves after a minor blip. 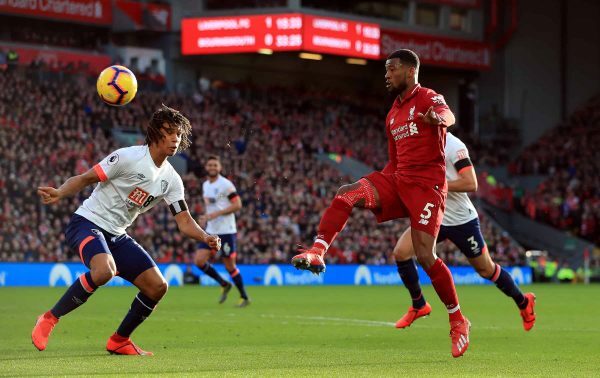 The outstanding performer on the day was Wijnaldum, who earned an average rating of 8.5 and showcased his influence after returning from injury. This is Anfield’s Joel Rabinowitz felt the Dutchman thrived in a “more advanced, free-roaming role than usual”, playing at the tip of a three-man midfield. Meanwhile, ESPN‘s Glenn Price described Wijnaldum’s chip as “audacious”, in what is a contender for Liverpool’s goal of the season. Naby Keita (7.5) has experienced a disappointing first season with the Reds but he was excellent on Saturday, playing with far more confidence. The Liverpool Echo‘s Ian Doyle highlighted the improvement in his “pressing, positioning and distribution”, although the Mirror‘s Alex Smith lazily described him as “peak N’Golo Kante-esque”, when his performance was very different in style. 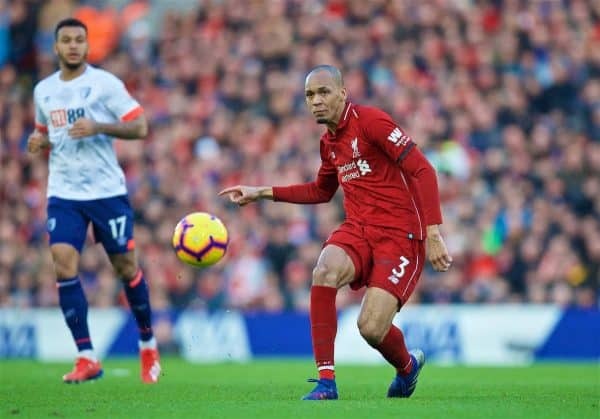 Fabinho‘s (7.6) influence in the middle of the park continues to grow and many were quick to laud his display. Rabinowitz felt he was “always on the front foot”, distributing the ball with real class, and Doyle claimed he looked “comfortable” in the 4-3-3 formation Klopp opted for. Stats-based website FotMob rated Salah (8.1) as the best player on the day, as the Egyptian netted his 49th Premier League goal for Liverpool. The 26-year-old produced three key passes but his off-the-ball work also stood out, with 10 ball recoveries made in total. Liverpool now have a 10-day break before entertaining Bayern Munich in the first leg of their last-16 Champions League clash on February 19.